Binghamton researcher M. Stanley Whittingham has been elected to the National Academy of Engineering for pioneering contributions to battery technologies. Whittingham is one of 83 new members and 16 foreign members announced, bringing the academy’s total U.S. membership to 2,293 and the number of foreign members to 262. He will be inducted during the NAE’s annual meeting in Washington, D.C., on Sept. 30. Whittingham, distinguished professor of chemistry and materials science at Binghamton University, joined the faculty in 1988 after 16 years at Schlumberger-Doll Research and Exxon Research and Engineering Company, where he received the patent for a rechargeable lithium-ion battery. He has been a pioneer in the development of lithium-ion batteries. He holds the original patent on the concept of the use of intercalation chemistry in high-power density, highly reversible lithium batteries – work that provided the basis for subsequent discoveries that now power most laptop computers. 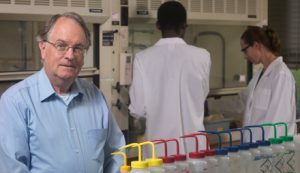 With 16 patents and more than 300 publications in leading scholarly journals, Whittingham has earned a national and international reputation as a prolific scientist. His research in the area of synthesis and characterization of novel transition metal oxides for energy storage and conversion, separations or as sensors has been continuously supported since his arrival in Binghamton, with over $7 million in federal research grants from the National Science Foundation and the Department of Energy. He now directs the NorthEast Center for Chemical Energy Storage, an Energy Frontier Research Center supported by the U.S. Department of Energy’s Office of Science. Whittingham helped to establish the Materials Science and Engineering Program, bringing his creativity and innovation to Binghamton’s graduate curriculum as well as to its laboratories. Working a great deal with ambient temperature, he and his research group emphasize novel approaches to synthesis that often allow structures to be formed that are unstable under the high temperatures normally used for preparing oxides. Whittingham has been recognized by his peers with two major awards in recent years. In 2002, he was honored with the Battery Research Award of the Electrochemical Society for his many contributions to “Intercalation Chemistry and Battery Materials.” Two years later, he was elected a Fellow of the Electrochemical Society. He has also been active in the American Chemical Society, the American Physical Society, the Electrochemical Society, and the Materials Research Society; and served on the editorial boards of several journals, including Chemistry of Materials and the Materials Research Bulletin. He was also the founder and principle editor of the journal Solid State Ionics, one of the two major journals in the field. Whittingham earned his bachelor’s, master’s and doctoral degrees from Oxford University, before coming to the United States as a post-doctoral fellow at Stanford University.